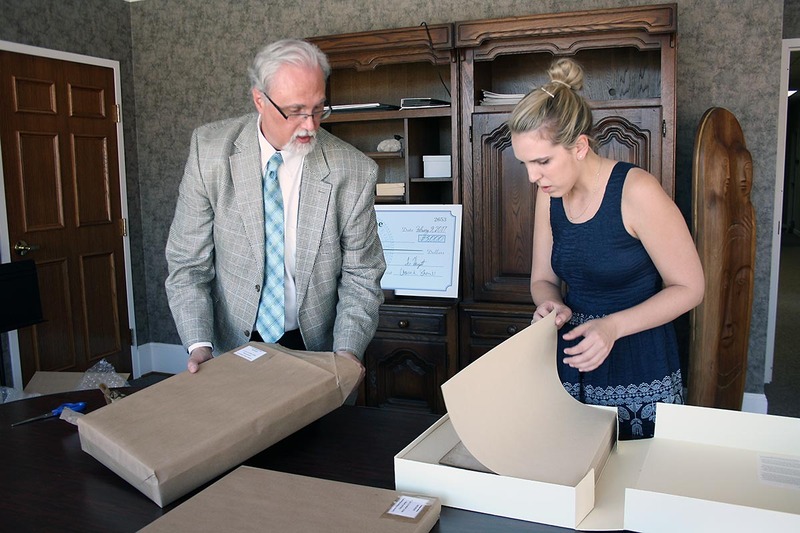 Clarksville, TN – An important record of Clarksville’s past returned, cleaned and restored, this month to Customs House Museum and Cultural Center thanks to help from several local organizations and individuals. Serepta Jordan’s diary from 1857 to 1864 in New Providence records murders, slave insurrections, the building of Fort Defiance (then known as Fort Sevier), mustering of troops, battles fought and lost during America’s Civil War, along with births, deaths, marriages, and details of daily 19th-century life. 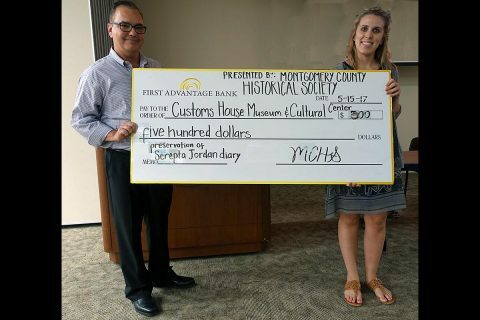 Customs House Curator of Collections Kali Mason receives a $500.00 check from Jeff Harris, treasurer of the Montgomery County Historical Society, to help pay for restoration of the journal kept by New Providence resident Serepta Jordan from 1857 to 1864. Found in a tobacco smoke house in the early 1980s, the diary was donated to Customs House in 1984. It was in sad shape—dirty, water stained, moldy. The museum staff preserved it but lacked funds to clean and repair it until this year when curator Kali Mason received a $3,000 grant in February from the State Library and Archives through the Secretary of State’s office to send it to the Northeast Document Conservation Center for cleaning. The grant paid for Phase I in restoring the journal—surface cleaning, vacuuming, and separating its pages to be put into sleeves so that researchers can read without damaging the fragile paper. The journal’s cover was deemed too far gone to be restored but will be stored as is. Further restoration was too expensive to undertake until individuals and organizations stepped in. An anonymous donor gave $1,000 toward Phase II restoration. Customs House Museum Director Jim Zimmer and Curator of Collections Kali Mason examine the newly restored Civil War diary of Serepta Jordan. The diary was found in a smoke house near Clarksville and given to the Museum in 1984. Then the Montgomery County Historical Society added another $500.00 and the Clarksville Civil War Roundtable put in an additional $250.00. The remaining $2700 came as a donation in memory of Evelyn Hunter, great granddaughter of Serepta Jordan. This restoration phase tested for ink solubility and washed the pages in a special bath, made minor repairs to page tears, and sized the pages with gelatin to strengthen them. The diary has been transcribed and various scholars have worked on annotating it for publication. Dr. Charles Holt, Austin Peay State University English professor, and Anne Alley, librarian at State Library and Archives, worked on the diary for several years. Current editors–APSU History Professor Dr. Minoa Uffelman, local historian Phyllis Smith, Montgomery County Historian Eleanor Williams, and Arts and Heritage Development Council Executive Director Dr. Ellen Kanervo—hope to submit the annotated journal to a university press for publication by the beginning of next year.